My goodness, we’ve had a week of patriotic wear! I didn’t realize how much I collected over the year just for this weekend! 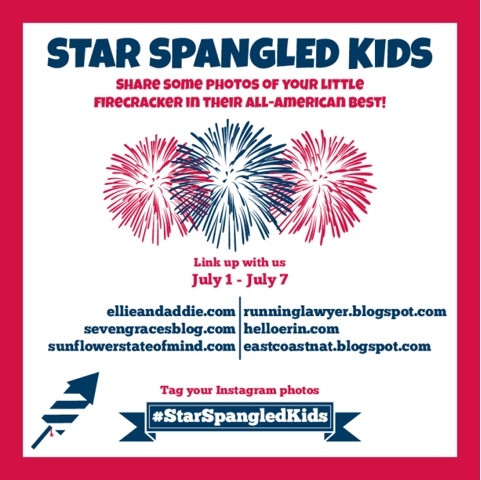 Here is a recap of all of our Star Spangled festive wear! Old Navy Romper – she wore this when she spent the evening with grandma. It’s on super sale now, stock up for next summer! Monogrammed Tee from The Pink Polka Dot STL and Boden shorts I got at consignment. Jessie makes the cutest stuff and she ships too! Grandma Special – I think this one came from Kohl’s, and I know nothing about it, other than Miss H got in the pool with it on! This post may contain affiliate links meaning if you click on it, I may get a little something, but not enough to buy a latte! Also when did you change your blog design? I love the new design, it's very sleek. Seriously the cutest and most festive little girl ever! Thanks so much for linking up with us!